Written by leading experts in the field, this book provides an authoritative and comprehensive introduction to cyclic plasticity of metals, polymers, composites and shape memory alloys. Each chapter is devoted to fundamentals of cyclic plasticity or to one of the major classes of materials, thereby providing a wide coverage of the field. The book deals with experimental observations on metals, composites, polymers and shape memory alloys, and the corresponding cyclic plasticity models for metals, polymers, particle reinforced metal matrix composites and shape memory alloys. Also, the thermo-mechanical coupled cyclic plasticity models are discussed for metals and shape memory alloys. Establishes cyclic plasticity constitutive models for different materials. Analysis of cyclic plasticity in engineering structures. 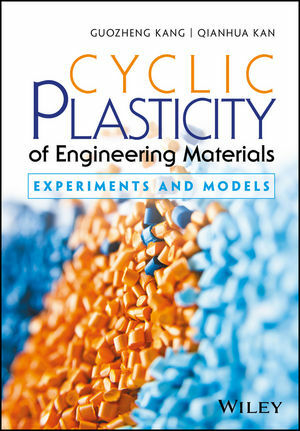 This book is an important reference for students, practicing engineers and researchers who study cyclic plasticity in the areas of mechanical, civil, nuclear, and aerospace engineering as well as materials science. Professor Guozheng Kang achieved his Bachelor Degree from Tsinghua University, China in 1992, and then he obtained his Master and PhD degrees from Southwest Jiaotong University, China in 1994 and 1997, respectively. Kang joined Southwest Jiaotong University, China as a lecturer in 1997 and was promoted to associate professor and professor in 2003 and 2005, respectively. He has received the "Alexander von Humboldt Fellowship", "Outstanding Young Investigator Award of NSFC", "Cheung Kong Chair Professor of MOE, China", and "Program for Ten Thousands Talent, China". His research interests focus on the cyclic constitutive models of advanced materials, fatigue and fracture, and meso-mechanics analysis of composites. Kang has published 5 books, 4 book chapters and 130 international journal papers. Currently, he is a member of the editorial board for five international peer-reviewed journals, including the International Journal of Plasticity, ZAMM-Zeitschrift fur Angewandte Mathematik und Mechanik, Acta Mechanica Sinica and the Journal of the Mechanical Behavior of Materials. Dr. Qianhua Kan obtained his Bachelor Degree in Civil Engineering with first class honors from Zhengzhou University in 2002. He obtained his Master Degree in Solid Mechanics from Southwest Jiaotong University in 2005 and his PhD degree from the same University in 2009. Following this, Dr. Kan joined Southwest Jiaotong University as a lecturer in 2009 and was promoted to associate professor in 2012. Dr. Kan visited Monash University (Australia) as an award holder of the Endeavour Research Fellowship for six months in 2011. His research interests include fatigue failures of smart materials, wheel-rail contact, biomechanics and finite element analysis. Dr. Kan has been awarded 5 research grants from NSFC and National Key Laboratories since 2009. Currently, he is supervising and co-supervising 13 postgraduate research students. Dr. Kan has published 5 books, 2 book chapters and 45 international journal papers.